I love the popping when you chew them. One of the best things about California is the pockets where different cultures flourish. If I want to get the best soda, made with real sugar instead of high fructose corn syrup, I go to a Mexican grocery store. 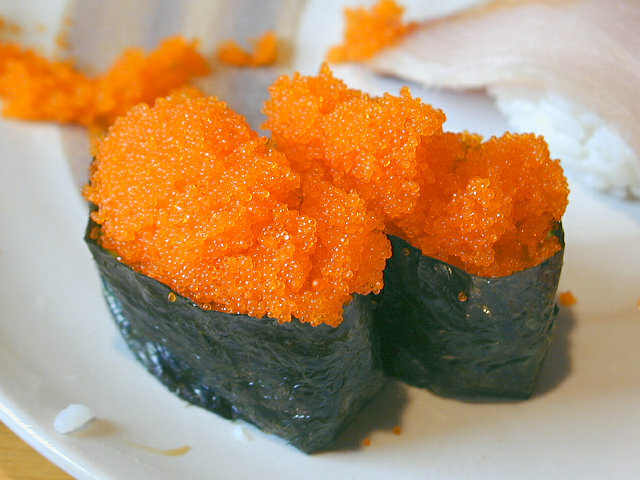 If I want a tub of masago to make my favorite nigiri at home (or just eat with a spoon, which I totally do), there's always a Japanese market somewhere within driving distance. Besides the ability to acquire foods that my walking-distance Ralph's doesn't seem to realize I need, these areas have another bouns: imported goodies! On Saturday I went with some friends and trolled through Marukai Pacific Market in Redondo Beach, and Mitsuwa Market Place in Torrance, where I treated myself to saki ika, Gummy Chocos, a couple of Iwako erasers, a strawberry tote bag, and some nigiri. 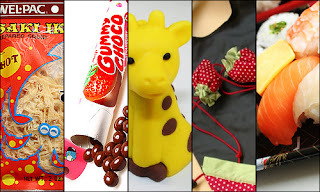 While some of these items may be difficult to find, they were entirely reasonably priced; the strawberry tote, for example, was less than half of what I usually see it priced as. Now this is a Saturday. 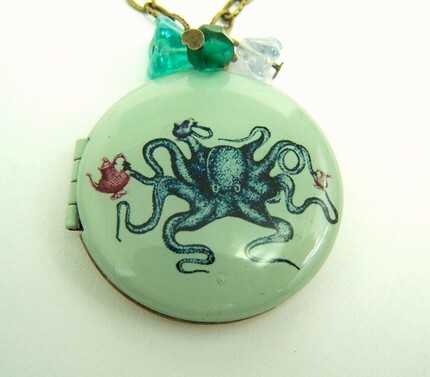 Sunday started off innocent enough with a trip to the second annual Renegade Craft Fair, where I purchased the most awesome locket ever, entitled Octopus Tea Party, by Locket 2 You. (Side-story: My companion and I were back-to-back looking at these lockets, and both turned to show each other... the same locket! So we both bought it.) On the way out my all-things-cute buddy notified me that she had never been to Little Tokyo, which is obviously a crime, so we went. I will refrain from listing the many things I bought there, but just being inside the Little Tokyo Mall is happiness, and the bookstore across the street, Kinokuniya, is a great source for Japanese masking tape (I got three rolls of matryoshka, she got some polka dots). But the real treasure of the weekend, the real thing that inspired this long-winded gushing about the joys of my shallow indulgences, is my new strawberry tea service for one. I like to chase my hot tea with cold water for maximum zen. I've been looking for a tea service for awhile. 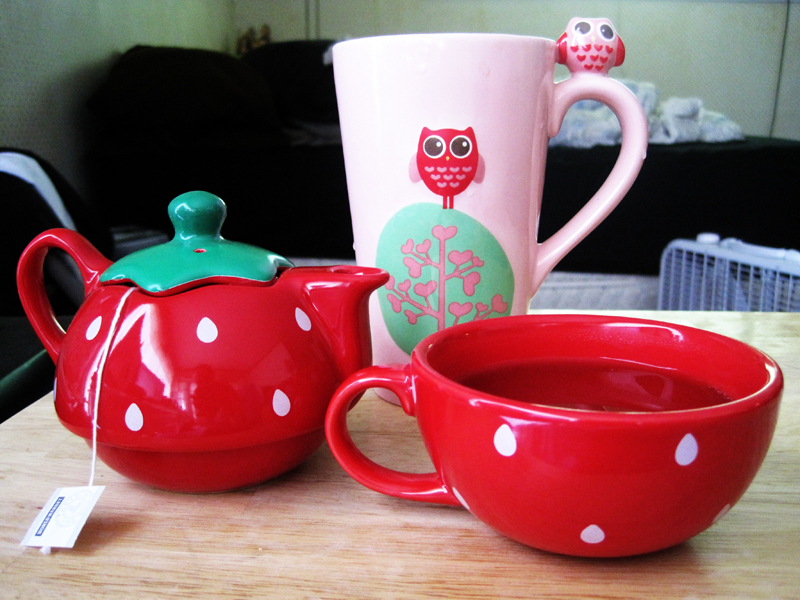 I almost went with Decole's Strawberry Cake Mug, which of course only went on sale when they sold out of pink. Then I yearned for Sun Art's Matryoshka Tea for Two, but it is just plain too expensive. This glorious piece of tea-pouring art was very reasonably priced, especially seeing that this one is ten dollars more (after converting Euros to USD). 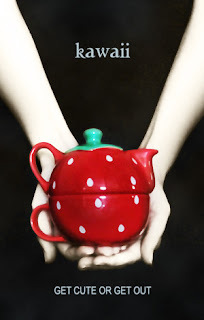 I have spend the last two days guzzling tea, my favorite guilt-free treat. Moral of this story: Don't be afraid to shun the American shopping malls and big corporate chain stores in favor of these magical little pockets where English isn't a priority. Oh my god. I NEED that owl mug. I seriously need it. And that tea pot. Damn! Yeah, Target's Valentines' Day 2009 collection was brilliant. I bought a bunch of stuff. This year's was just lame hearts! I think you would do well. I'll bet those pin cushions would sell really well; since people go there wanting to buy SOMETHING and everything's so expensive, they often seem to snap up the cheaper things. Just be sure you have a lot of product in your booth to make it worth it! And you would probably have to set yourself up with a credit card machine. And I recommend making something for kids. It seems like people stupidly bring their kids to these things (I HATED it when my mom and grandma brought me to craft fairs) so they end up buying something ridiculous at one of the few booths that sell kid stuff. Oooh, that's a clever idea! I like making plushies. I could make some of those, kids like that. That snail plush that I made is really quick to make. It's literally cutting out, sewing, stuffing, sewing up the bottom. I could make a few more originals like that. There's a craft fair right near my house that I found, this fall, and the table for one day is only about $60. It's in September, so I have time to prepare, if I do sign up. If I could even break even, I'd probably be happy, because I'd be getting my name out there. I'll have my 250 business cards by then, so I'll have something to give out! Oo, $60 ain't bad at all. It wouldn't take a crazy amount of sales to make up that price. I hope it works out! And little plushies sound like a good plan. Another thing I saw several kids wearing were headbands with little plushy ears attached.